WBX offer markets on sports such as football, horse racing, cricket, tennis alongside many other popular betting events. For those of you impacted by the withdrawal of the likes of Pinnacle Sports from the UK market, they offer another solution for you. In fact, whether or not you are a UK based punter or not, there is every chance that WBX might well be of interest to you, especially given the wide range of sports they cover. To find out more on what they offer, Peter over at WBX was kind enough to answer a variety of our questions on their service. WBX (World Bet Exchange) is a leading sports betting exchange that launched in 2006 when the founders saw an opportunity to put control back into the hands of punters by offering an alternative betting exchange to market leader Betfair. WBX has competitive odds that are often better than those found at traditional bookmakers. The odds are comparable to other leading exchanges. There is a large selection of sporting events, covering over 20 sports internationally, with better live odds especially on high interest sporting events such as Australian Open Tennis, Cricket ODI/Twenty20, Premier League matches and more. Many punters are now looking for alternatives to the likes of Pinnacle Sports & SBOBet who have recently left the UK market due to the new gambling and licensing act and its Point Of Consumption (POC) Tax. Can you confirm you will be trading beyond the 1st November with UK punters and detail how the new gambling act impacts you as a business if at all? I can confirm that WBX and its members will not be affected by the legislative change. WBX has been licensed in the UK for more than ten years since before its launch and have always paid duty to the HMRC for all its members. The main effect is that it will put our competitors on an even playing field with WBX in the UK. With several major players dropping out of the UK betting market, there will be many punters looking for new sites to bet with. Those that are applying for the license in order to continue operating in the UK will likely look to recoup these costs somehow, with some passing it along to their members in the form of lower odds for bookies and higher commission for betting exchanges. WBX commission rates will remain unchanged. The new POC tax has knocked out plenty of your competitors for the time being at least. What would you say to those people looking for an alternative place to bet and considering WBX? As you mentioned in the previous question, Pinnacle Sports is one of the top bookmakers leaving the UK market. Relative to other bookmakers they have a good reputation for offering good odds and welcoming winners. These are two of the core strengths that WBX offers its members. The odds available at WBX are often much better than those you can find with bookmakers, and we do not discriminate against winners. After all, if you aren’t allowed to win then what is the point of betting? As an added incentive to switch to WBX, we will match existing discount rates with competitor betting exchanges. For example, if you have a 30% commission discount rate with Betfair or Ladbrokes Exchange/Betdaq, simply sign up with WBX and contact our Member Services team to carry over your discount at WBX. Traders can look at WBX as an alternative to bet with when the odds are favourable. With lower commission and no premium charges, you can make the same bets at WBX with added security in the event of unscheduled maintenance at the exchange you normally bet with – you will be able to trade out at WBX if you find yourself heavily exposed during downtime. What are your current fees and commission rates and will these be changing in the future, especially in regards to the new point of consumption tax? The commission rate varies from 3% to 5% charged on net winnings in a market and is based on the number of entrants. The way it works is if a market has 3 entrants or less, for example a football match with win/lose/draw, a basketball match with win/lose, cricket match with win/lose/draw, in fact most team sports, we charge 3% on net winnings in a market. Other sports with more than 3 entrants such as horse racing, greyhounds or winner markets will be charged 5% on net winnings in a market. Most payment types offered such as Skrill/Moneybookers and NETeller have no charges, with a few at a small fee. These fees are often subsidized by WBX to be lower than the actual cost price so it is very fair for the member. For a full list, check it out here. As mentioned earlier, WBX is positively affected by the new legislation, with no plans to increase the commission rate or increase any costs to our members. Can you tell me more about your loyalty discounts and how they work? How much does a customer need to trade on WBX to start to benefit from them? The WBX Loyalty Discount is based on how many WBX points you have accumulated. Members receive 1 WBX Point for every £1 in commission generated by their bets. Whether this is on the winning side or losing side of the bet, Members will still receive 1 point. For example, if you win £40 on a horse race and pay £2 commission, you will get a 1% discount on your commission. If you reach 8 WBX points, it is a 2% discount and so on. The more you bet, the more WBX points you get and this increases your WBX Loyalty Discount percentage that is capped at 60%, equating to a rate as low as 1.2%. The 60% discount rate is generally achieved by high volume traders and market makers giving them an added incentive to bet more at WBX. However, getting a 20% discount rate is much more achievable to the mid-range punter. For example if you tend to bet on horses or greyhounds a 20% discount from 5% to 4% commission would account for a win/loss record of £15.6k or 780 WBX points. Furthermore, WBX is the only betting exchange to offer a Loyalty Refund. The way that this works is if you improve your discount rate, any commission paid in the previous 60 days will automatically be counted with your discount applied. If you trade in high volumes this can benefit you, knowing you’ll get to 60% rate within 2 months of joining. You can rest assure that all of your earlier bets will be on the lowered rate as well, because WBX will refund you the difference. How does your take on commission compare with your competitors? If you were to bet on football at Betfair, compared to WBX you’re paying nearly twice the commission there. When our odds are very similar it means you are winning more on your bets at WBX and don’t need to worry about additional ‘premium charges’ that are aimed at Betfair accounts who are showing a profit. These charges can be as high as 60% of the gross profits on winning punters, so if you have a gross profit of £10,000 you would be handing them back £6,000 in premium charges. In fact once you factor in WBX Loyalty Discount, WBX actually charges the lowest commission of any betting exchange. For serious traders that focus on sports such as football and tennis, WBX commission can be as low as 1.2% on wins. This is far lower than Betfair and Betdaq, nearly half Smarkets, and when you factor in Matchbook charging 1% on wins and losses it beats their rate as well. We also do not vary the commission rate from one country to another, as we have seen others increase their rates as high as 7.5%. Which markets and sports offer the best liquidity at WBX? Horse racing is the top sport on offer at WBX. In the minutes leading up to each race the betting activity picks up to a furious pace with odds rapidly moving as members get their bets down in a flurry. It can be a very exciting sport to bet on at the exchange, and part of the attraction to that is the ability to both back and lay bets, as well as seeing much higher odds on outsiders than you would get at a bookmaker. For example middle of the pack horses in big races are paying between 13.0 to 16.0 at the bookies, but are paying 40.0 and higher at WBX so there are opportunities to win 2-3 times as much on the exchange. Football is another very popular sport, particularly the bigger leagues like Premier League and Champions League. WBX offers over 3,000 football markets weekly and has an excellent selection of live betting markets with a lot of activity on the bigger matches. However, we also offer a varied number of other leagues the average punter can easily get bets down on local tournaments if betting on them is of interest, for example Singapore S League, or Paraguay Primera Division. Tennis, is undoubtedly another of our Members’ favourites to bet on. Every match from the ATP and WTA tours is offered live. There are great opportunities to trade and lock in profits as odds swing from one point to the next. Cricket and Greyhound racing are also very popular, American sports such as NFL and NBA, and Australian sports like AFL and NRL also have a growing following on the exchange. For live betting, WBX offers better live odds with good liquidity on high interest sporting events such as Australian Open Tennis, Cricket ODI/Twenty20 and Premier League. Do you have any stats or details on how your liquidity compares with your competitors? Are there certain markets or sports where there are specific advantages to using WBX? WBX members have wagered over £1,000,000,000 on the exchange and over 3 million bets are processed daily. Most markets offer competitive odds and members can easily get their bets matched. The advantage to betting at WBX is that it combines the best of both worlds when it comes to lower commission, and a large selection of pre-match and live markets to bet on. There are exchanges that have high liquidity and charge hidden fees and commissions, there are also exchanges that have low commission but the liquidity and selection of markets can be quite poor. WBX is a well-balanced medium, in that it is one of the major players in the exchange betting market, while also having low commissions and a reputation as a trusted betting exchange. What odds comparison (if any) websites do you appear on? Odds Monkey and Sports Punter are just a few sites that carry WBX odds, there’s far too many to list. Our affiliate program offers the XML odds feed so webmasters can promote our better odds. In return we give them a generous 50% of the revenue that’s generated by those referrals so it is a win-win-win situation for us, the affiliate and the member. Do you have a mobile website or app? Yes, unlike other sites that have members to download an app we’ve simplified the experience for the visitor. When a visitor accesses WBX with their mobile or tablet, it’ll automatically detect it and give them the choice to access the standard WBX.com website, or a version that is optimised to their device. There are 3 versions of the site suited for smartphones, tablet devices, or for older mobile phones, offering them the same secure experience with the same odds and markets available as the main WBX website. We also run promotions occasionally for mobile users, and we recently had a £10 free bet for tablet users which was quite popular. A regular criticism of the likes of Betfair is in relation to their website downtime – how does WBX compare on this front and how stable is your platform? WBX.com boasts a 99.9% uptime. It is uncommon to have any unscheduled downtime. The technical team runs a very tight ship and understand how important it is for traders to have access to a reliable exchange betting platform. Nobody wants to have a large bet exposed and suddenly see a down for maintenance message appear. How safe and secure is money deposited with WBX? Member funds are extremely safe. In fact, WBX is possibly the single safest website to bet at. There are a few reasons for this, firstly, WBX is not like any normal bookmaker where they are exposed to large bets going against their expectation and suffering heavy losses. Our members bet against each other so there is no risk no matter the outcome – one side will win, one side will lose, WBX simply acts as a broker to facilitate people betting against each other. Member funds are kept secure in a trust fund under a separate company, WBX Member Funds Limited. This trust fund can only be used to pay out winning member bets, and undergoes regular independent external audits with the results published quarterly on the WBX website. WBX does not make slow pay outs or give customers the run around. With WBX you are betting with a reputable betting exchange and can rest assured that when you bet and win you will receive your winnings. Do you have any other developments or upcoming improvements to the WBX service you can tell us about? We are looking to further improve our live betting offerings available for basketball and other sports. Although we often receive positive feedback for our website’s intuitive and quick response design and feel, we are planning to improve it in the near future. WBX have been around for several years – what would you say to those who may have tried you in the past as to why they should revisit your website? As WBX continues to grow in popularity, the betting experience also improves because it is the members on the exchange that dictate the quality of the odds on offer. Our live betting offering has improved and for those that have been betting at other exchanges, as mentioned earlier we will match their commission discount rate. Also, if anyone reading this found something lacking in their experience with WBX, we welcome constructive criticism and would love to hear from you first hand on what can be improved, what you liked, what you didn’t like. Our member services team will value any feedback that you have to offer. Finally, do you offer any incentives or free bet offers for those registering for the first time with your website? Yes, WBX members receive £25 / €25 / $35 in free bets. The first free bet is given as a £/€10 free bet when the member has won or lost £/€100. The way that this works is that they can win £/€50 then lose £/€50 and this will be enough to generate their first £/€10 free bet, with more free bets to come in £/€5 increments. Something that sets our free bets aside from most is that winnings from those free bets can be withdrawn immediately without having to roll it over x number of times at certain odds. Members are free to bet at the odds they choose, which is something that many bonuses do not allow in their fine print. If you enjoyed this interview with WBX, you can find access more expertise dedicated to helping you improve your betting profits as a member of the Smart Betting Club. You’ve all seen the headlines, I’m sure. I imagine the first thing that many folk do when they’ve bought their copy of the Racing Post is to turn to the Pricewise pages to see what Tom Segal is tipping that day. I also wouldn’t mind betting that the number of hits on the Attheraces website goes through the roof each morning when Hugh Taylor’s selections are due for publication. After all, these guys have proven themselves to be shrewd readers of the formbook. And what’s more, these tips are free! If something seems too good to be true, then it usually is! I’m sure you’ve heard this old adage. Thing is, it’s often spot on and never more so than when we look a little more closely at some of these big-name, superstar tipsters that give out their bets for free. Let’s take Hugh Taylor. There is no doubt the bookies are scared of him. Why wouldn’t they be? Looking at the Attheraces website, we can see he’s had five consecutive years of producing a fine profit. 28% ROI in 2011, 31% ROI in 2012, and 32% in 2013. Not bad, eh? Not bad at all. As for Pricewise, well, good luck with getting their advised odds! What you gonna do? Get to the newsagent for 6 in the morning? Keep your finger on the refresh button hoping to be first to get the tips through online? Something we put a lot of emphasis on here at the Smart Betting Club is how achievable it is for the average man on the street to get the odds the tipsters are tipping at. Or at the very least, finding out how easy is it is to get acceptably close to those advised prices. And with that in mind, we put in a lot of effort to check this out properly, in a real time environment. Which is why, when someone asked us recently whether Pricewise or Hugh Taylor are in our “Best 55 tipsters” from our latest Tipster Profit Report, our answer was no, they’re not. They’re both good, obviously, but you just can’t get the odds on their picks. In other words, following these guys is a great idea in theory, but near useless in practice. Put bluntly, with these tips, the stated profits cannot be replicated, because the odds recommended aren’t actually available when you can put your bets on. Now if I said to you that these numbers have been achieved by a tipster that we’ve been tracking for years, who is possibly not quite as well-known as Pricewise or Hugh Taylor, but who is still free to follow, AND that these results were gained using odds that are available when the tips are released, what would you say? This is no flash in the pan, either. At the SBC, in addition to odds availability, we also emphasise the importance of longevity. In total, we’ve tracked this free tipster for over four years and 925 bets, which have produced a stunning long term Return on Investment of 32.6%! Just to reiterate: these results are calculated using odds actually available when the bets are issued, NOT by using the prices quoted by the tipster (which in this guy’s case are usually available anyway). Increased exposure, Hall of Fame entrant, and yet STILL the odds are available! After a quite phenomenal 2013, which followed incredibly strong long-term performance gained over previous years, we decided to introduce this free tipster into our ‘Hall of Fame’ of elite tipping services. Naturally this increased exposure to the tipster, and as a result more people will have to started to follow the bets with hard cash. And yet, from our independent odds analysis that we’ve carried out through 2014, we can still see that following these bets still produce tremendous, and easily achievable, profits. Average odds the tipster quotes: 19.8. Odds actually available at time of bet release: 19.75 (a decline in odds of just 0.26%). Odds available at 9.00am: 19.38 (a decline in odds of just 2.12%). Odds available on the Exchange: 19.09 (a decline of just 3.59%). The conclusion? That if following this tipster, we have to factor in a very small drop in the odds taken from those the tipster actually quotes himself. But we’re not seeing horses tipped at 20/1 that it is only possible to get 12/1 against, or rushing frantically to “snap up” 20/1 against a horse that only seconds ago had been tipped up at 33s! In a nutshell, we have three excellent free tipsters, but only one that will land you consistently excellent profits…the one in our Hall of Fame. It’s very easy to look at the headline figures of many betting services and be fooled into thinking that replicating those figures is dead easy. t’s not. Not unless you choose the right services. We do the hard work so that you know who to follow to make real, not theoretical, profits. Last week saw the release of the very latest Smart Betting Club Tipster Profit Report – containing everything you could ever possibly need to know to consistently take money off the bookmakers. 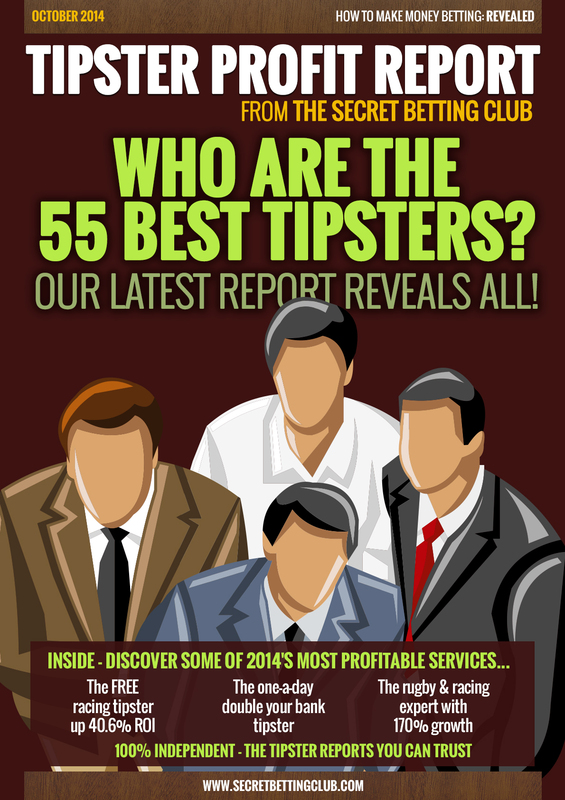 This report contains the finer details on the 55 best performing tipsters that we have uncovered in the eight and a bit years we have been monitoring the tipping industry. To give you an idea on how valuable this latest report is – here are a few highlights from what you can find this month…. It’s always pleasing to see a tipster with an outstanding track record at the big race meetings and this expert certainly does that! He has been churning out tremendous profits recently, with winners at 25/1, 25/1 and 18/1 in the last few weeks alone. In fact, since the start of the year, this FREE racing specialist is running at a stunning 40% return on investment! And this is no one off…2013 rewarded followers with an overall 47% return on investment. We think this guy is better than Pricewise and what’s more a heck of a lot easier to follow and of course totally free. In each Tipster Profit Report we put great emphasis on those tipsters who have the ability to grow your betting bank on a regular and consistent basis. Which is why this particular racing expert we track ranks so high in our tipster tables, despite providing just one tip a day. Members of this service have literally doubled their initial starting bank from the start of the year, as they benefit from a regular supply of winners at good odds. What’s more this service is flying at present, producing a return on investment for followers of 73% over the past two months. Yet it’s not just short term bursts we’re interested in at the SBC. This service has quadrupled its bank since proofing to us, over four years and 1,781 bets. And yep all from placing just 1 simple bet a day – It’s almost too easy! Riding high in all of our league tables – including in the “Best All Time Sports Betting” category, is this proven rugby and racing service that provides strong profit with incredible consistency. A bank of just £1,000 invested on 1st January 2014 would now be worth an amazing £2,700 as at the end of September 2014. £1,700 profit in just 9 months is not to be sniffed at. This is no flash in the pan either as that same £1,000 bank invested in January 2012 would have grown into £6,369, so you can see the massive boost this service can give to your betting profits. If you want to find out more on the 3 tipsters above (+ the other 52 in the latest report) then grab your copy of it the instant you join our service at the Smart Betting Club. As an SBC member you can also gain access to our huge 8+ years back catalogue full of tipster reviews, expert interviews and guides, betting systems and profitable betting advice. The other great news is that if signing-up for a Gold membership you can enjoy this for the equivalent of just 27p per day with a full money back guarantee if not in any way satisfied once you joined. The very latest Smart Betting Club Tipster Profit Report is out now and features the latest results for 55 of the very best betting tipsters we have uncovered in over 8 years of independent reporting. In this report you can find tipster league tables, ratings and our sought-after ‘Hall of Fame’ listings, all aimed at helping YOU identify which tipsters are genuinely profitable. > 55 Top Tipsters Rated: Their latest results up to September 30th 2014 PLUS our incisive tipster commentary. > Hall of Fame Tipsters: The 22 elite tipsters we recommend you follow. 2. The one-tip-a-day expert who has doubled his subscribers betting banks. 3. The rugby & racing expert with 170% betting growth or ‘Return on Capital’. And all from the only 100% independent tipster source! Yes that’s right as whilst all over review sites use affiliate links or make money referring sales to the tipsters, all SBC tipster reviews and ratings are 100% independent and affiliate-free! Free Football System – The Latest Value Tips & Save 10% On SBC! One simple way to profit from betting on the Euro 2016 games is to download a free copy of our International Football Betting System, which after making over £465 profit from £25 stakes during the 2014 World Cup – is well worth following. BUT BEFORE YOU DO THAT…Read on first about tonight’s qualifiers & how you can save 10% on SBC membership! To whet your appetite – here are a few of the qualifying ‘value bets’ as generated by our International Football System which kick-off tonight (Thursday). It is just a small sample but gives you an idea on how it all works. The best bets are those with over 10% value or more and are highlighted in yellow as in the graphic below. Those games where there is value in backing 2 outcomes (for example Draw & Slovakia) may well be worth playing in the Asian Handicap markets. You can find more details on how to do this in the full system guide. If you enjoy our International Football System, then you might also like to consider a full Smart Betting Club membership and get even more systems and advice on how to make money football betting. To take advantage, simply use the coupon code ‘rooney’ when signing up for either a Silver or Gold membership and 10% will be automatically deducted! One simple way a Smart Betting Club subscription can help you make money football betting is through access to our more advanced football system. This advanced system reveals how you can value bet on English football from the Premier League down to League 2 on both traditional 1X2 markets and Asian Handicaps. This is fully updated to the start of the 2014/15 season and is supplied as part of our Ultimate Betting Package, available to all new Gold or Platinum Smart Betting Club members. Hot on the heels of our Q&A session with Matchbook last week, today we have an interview with another up and coming betting exchange of note – Smarkets. Smarkets operate a low commission betting exchange with a variety of markets catered for including horse racing, football, tennis & political bets. This interview is part of our quest to seek out more genuine bookmaking alternatives for UK punters impacted by the withdrawal of Pinnacle Sports & SBObet from the UK market. In fact, whether or not you are a UK based punter or not, there is every chance that Smarkets might well be of interest to you, especially given the wide range of sports they cover. To find out more on what they offer, Chris over at Smarkets was kind enough to answer a variety of questions, including a number put forward by some of you via the SBC Twitter account. All new Smarkets accounts are also eligible for a £10 welcome bonus as long as you deposit at least £20 with them initially. SBC: For those unaware of your service, can you briefly introduce Smarkets and what you can offer punters? Smarkets: Smarkets is a sports-betting exchange that has been operating since 2010. Across the industry odds are bad value and operator margins are too high. We want to change that, and bring the efficiency and transparency of financial markets to the betting industry. Already with Smarkets you have access to liquid markets on all major sports, including football, tennis and horse racing, with an industry-low commission of 2% on winnings only. Our longer term aim is to be the cheapest, leanest and slickest betting experience on the web. We want people who care about price, liquidity and technology to see Smarkets as their go-to exchange. SBC: Many punters are now looking for alternatives to the likes of Pinnacle Sports & SBOBet who have recently left the UK market due to the new gambling and licensing act. Can you make a definite statement that you have no plans to leave the UK market? Smarkets: Sure – we are not leaving the UK. The UK is very much our core market. We have registered with the Gambling Commission in the UK, who will be issuing continuation licences in the next month, so we will be able to continue to accept customers from here. Smarkets: If anything this is an opportunity for us. We won’t experience any significant extra costs and the shakeup of the UK betting industry can only be a positive occurrence as we obtain a UK license and fill the vacuum from other companies leaving. SBC: The new tax has knocked out plenty of your competitors for the time being at least. What would you say to those people looking for an alternative place to bet and considering Smarkets? Smarkets: We’d say to them that if you are a savvy trader that cares about value, odds and liquidity, Smarkets is the place to trade. Our markets are liquid and offer some of the best odds out there. Our commission is a simple, no catches, no small-print, 2% on net winnings, with no charges for volume. As a result you win more with Smarkets than almost any other operator. If you’re not convinced and just want to try us out without committing, we also offer a £10 sign-up bonus, which will refund any losing bets back to you. SBC: What are your current fees and commission rates and will these be changing in the future, especially in regards to the new point of consumption tax? Smarkets: We charge a flat 2% commission on net winnings. You can trade as much as you like and in and out of a market without incurring any charges – only your net winnings will be charged. With no charges on betting volume we believe that makes our commission the best value out there. The UK point of consumption tax won’t impact that. We’re one of the leanest operators around, with a smart core development team and low overheads. This means we can absorb the taxes better than most other companies. Our outlook, that margins in the industry remain too high and need challenging, is not going to change. SBC: In terms of the markets you offer, how does the liquidity and the amount of money available to back and lay stand up on key sports such as football and horse racing? Smarkets: We calculate volume in a market by adding up how much has been risked. Volume traded can be larger elsewhere though this does not impact the liquidity available. In the context of horse racing I’ve found our liquidity to be at the same level as our competitors. If a trader wants to place a very large bet then he should have no problem getting matched with us if the market is also liquid elsewhere. SBC: How do you calculate how much money is traded (i.e. the liquidity?) I ask as when I compare a horse racing market available on Betfair with Smarkets, there does seem to be a much greater volume of money matched on Betfair. Smarkets: The volume traded at other exchanges can be significantly more though it is also worth considering that all exchanges use different formulas for measuring this. Whilst volume traded may be larger elsewhere this does not impact the liquidity available. In the context of horse racing I’ve found our liquidity to be at the same level as our competitors. If a trader wants to place a very large bet then he should have no problem getting matched with us if the market is also liquid elsewhere. SBC: When trying to place several bets quickly, I found your website navigation a little clunky and hard to move between markets easily. Your sub-menus appear in the main window, rather than underneath the parent section. Have you any plans to change this or improve the flow between markets for users? Smarkets: We do get a lot of comments about this and we will be working on updating this soon. In the meantime, the search bar should offer a quick way to switch between markets. SBC: Do you have plans to introduce a price and volume of money history (including a graph) for any bet you offer, similar to that available on the likes of Betfair? Smarkets: Yes, adding richer and more detailed trading data is on the roadmap. We already publish trading volume stats and we’ll be looking to add to this to ensure transparency. SBC: What odds comparison (if any) websites do you appear on? Smarkets: We have a public odds feed available and those sites currently publishing it include Odds Monkey, Best Betting, BetBrain, BetOnValue, OddsOddsOdds, amongst many others. SBC: Via our twitter account – @SunnyRanmal wanted us to ask if you were looking to address the amount of downtime and unreliability that your IT systems experience? Smarkets: We recognise that downtime has been an issue in the past – given we care so much about technology it’s something we’re a little embarrassed about. Part of the problem we face is that as we grow we experience new technological challenges related to the overall load on the site – to give an idea as to the scale of that problem, since January our active user base has tripled, while at the same time you find increasing numbers of scrapers and other heavy load users. We’ve expanded our engineering team to help us meet this demand. That said, we’ve made some big changes recently that have improved downtime statistics – as we write this, we are currently running at 99.9863% uptime over the last 30 days. That’s largely come from some infrastructure changes we’ve made. We’re continuing to make changes in the coming weeks which will allow us to quickly scale up to meet demand during peak times. We are also focusing at present on improving site performance and responsiveness, especially during busy periods. SBC: Also on twitter – @CrazedAlchemist asked how long it will be before you introduce a mobile/tablet app for use with Smarkets? Smarkets: We already offer some mobile functionality at m.smarkets.com. This is suitable for any smart phone and offers most of the features of the exchange but on your phone. Alongside this we released a Smarkets app for android last year. We will also be developing a dedicated app for iOS, which we plan to do within the next 12 months. SBC: @Levelstakes also wanted to know how secure the money deposited with you is and whether it was ringfenced? Smarkets: Yes, player funds are segregated from our company funds and held in separate accounts with regulated financial institutions in the European Union. The Malta LGA and since May 2014, the UK Gambling Commission have both required a high level of protection and reporting of player funds. This reduces the chances of players losing out in the event of insolvency. We’re also currently a well-funded business with low costs and with investment from leading European venture-capital funds, including Deutsche Telekom. Also, with Smarkets parent company being in the UK, our shareholders are public record. SBC: Finally, do you have any other developments or upcoming improvements to the Smarkets service you can tell us about? Smarkets: Over the next 6 months most of the changes to the site will be behind the scenes – we want to make the trading experience ever-faster and more responsive. This is the key to attracting liquidity from serious traders. As well as that, we’ve mentioned some of the other stuff we’ll be working on – interface improvements, more data, native iOS app. If any of your readers have any more questions or want to learn more about us, they are welcome to contact us directly via the live chat on the exchange itself or by emailing us at support@smarkets.com. You can like us on facebook and follow our twitter accounts @Smarkets and for tech related tweets @SmarketsTech. Traders are also very welcome to drop by our offices in London for one of our open-house events. We will be holding another one before the end of the year and details will be released via twitter and our blog. Our thanks go to Smarkets for taking the time to answer these questions. If you enjoyed this interview with Smarkets, you can find access more expertise dedicated to helping you improve your betting profits as a member of the Smart Betting Club. One of the lesser-known perks of being a Smart Betting Club member is the access this grants you to our exclusive betting forum, where a number of top tipsters continue to post up their best tips each day. One tipster in-particular, Sandy, continues to impress and since I last blogged about him back in September, he has made another 55.74 pts profit from his most recent 68 bets (the majority of bets are at 1pt stakes). If you followed each and every bet in – at £2.50 stakes alone you would be over £600 in profit…and if upping this to £15 per point – it works out at way over £3,600 profit in just over 10 months. If Sandy’s All Weather Tips interest you then you can follow his tips each day by logging onto our members-only Smart Betting Club Forum (access to which is granted with either a Silver or Gold subscription). Not only this but Sandy has also agreed to post his tips up for free on the SBC forum until at least January 2015, so if joining today you will get just under 3 months access to his expertise. As a further added benefit, as an SBC Silver or Gold member you can also sign-up to receive these tips via email as well as finding them on the Forum.